No city in the world has such a breathtaking panoramic view as Prague. 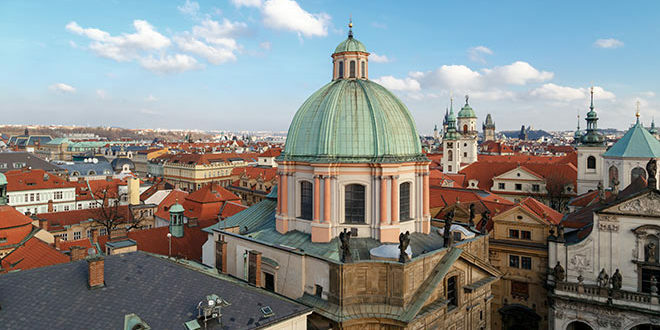 The nicest view of Lesser Town of Prague or Prague castle with Strahov and Petřín is from the viewing tower of Old Town Bridge Tower. But not in full light, when everything is overexposed, but at dusk. The darkening sky highlights the beauty of architectural miracles and our national river Vltava. The tower is not only a fortification building, but also a triumphal arch, which was used as a coronation procession to Prague Castle. This was determined by Charles IV when he built a new stone bridge linking the Vltava banks in 1357. The bridge, three times craned, was completed in 1402, measuring over 515 meters. The tower was completed in the 70s – 80s of the 14th century. Its architect is probably Petr Parléř. 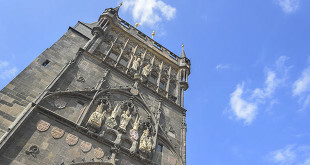 On the side of the Old Town, the tower is decorated with sculptures of Charles IV, Wenceslas IV, Vitus, Zikmund and Vojtech, with an added statue of a lion. The tower was damaged by the Swedish troops during the Thirty Years’ War, and then during the revolutionary storm of 1848. The heads of the executed, after the defeat of the Protestants on the White Mountain, were exposed on the tower in 1621. According to accounts, the defeat was very tough; the insurgents were expecting mercy from the sovereign, but instead of that there came executions, some of them also linked with torture. After the White Mountain battle, foreign nobility moved to Bohemia, very often German- and Italian-speaking, because the wealth of executed lords was enormous. After the execution, the headsman Mydlář carried twelve heads in two baskets to the tower. They hung on long iron bars in wire baskets. Six of them hung in the direction of the Lesser Town of Prague, and the other six in the direction of Old Town. It remains a mystery where those skulls disappeared to after being displayed for a long time. A cut-off hand had been put on the head of Ondřej Šlika, and on the head of professor Jesenský they placed his tongue, which had been cut off while he was still alive. Between 1874 and 1878, the tower was reconstructed under the direction of the architect Josef Mocker. When standing on the top of the tower, behind us there is the Jesuit convent of Klementinum and the Křížovnický klášter, and from there there is a nice view of Old Town and Vítkov. From the tower you can see the curvature of Charles Bridge, which you won’t notice if you only cross it. The view of the gas lamps, which are, as in the past, lighted by a man with a bar with a pole end, Mr Žákovec, and the illuminated ships passing by on the Vltava River is really uplifting. Only a total ignoramus would be untouched by this picture, but this ignoramus would not pay one hundred crowns to look at this beauty of the world. There are lamps on the Petřín lit by the trails, which go up to the viewing tower. The cableway forms the light line. The Petřín lookout tower is illuminated, just like the Strahov Monastery. Without St Vitus Cathedral, it would be a boring long row of palaces. A gothic finger to the sky from the royal residence makes it an extraterrestrial beauty, under which the palaces, houses, churches, especially the Svatomikulášský temple with the bell tower, the Lesser Town Bridge Tower and the Church of Our Lady at the Infant Jesus gather by the embankment. Prague also goes on via Kramář’s villa to Letná, with the Vltava river disappearing in the distance. The Charles bridge, the Gothic jewel with statues of saints, is only rarely deserted. Maybe in the hour between dog and wolf, in the very early morning or in bad weather. Otherwise, the crowds flow, and no one is left cold by the beauty. Add Kampa to this, and we can be very grateful that our ancestors have left us such beauty.